Fallout 76 will have emotes, according to the gameplay trailer revealed at Bethesda’s E3 conference last night. It was a ‘blink and you’ll miss it’ moment that you’d be forgiven for not really noticing given how much more was revealed in that jam-packed trailer. The emote system appeared in the form of an wheel that two groups of players seemed to be using to converse with one another. It seems that players can simply select the emote they want to express from the wheel, in a similar manner to the wheels from games like PUBG and Fortnite. Check out our big list of upcoming PC games. It does look, however, like you’ll actually need to use the emotes to communicate with other players. 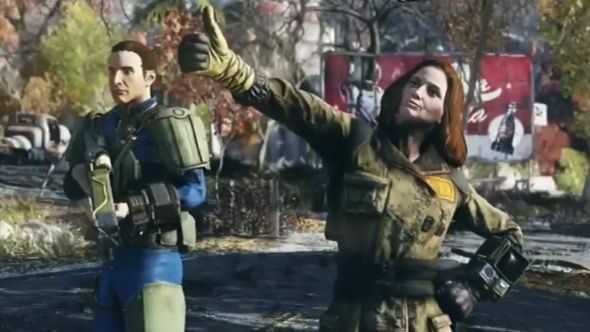 After all, Fallout 76 is entirely online, so the people you meet in game won’t be simple NPCs, and you might need to bargain with them – of the two emotes used in the trailer, one is simply called “looking to buy.” Other emotes include a thumbs-up, while another is a thumbs-down. There’s also a couple of distressed-looking Vault Boys used to portray various levels of dissatisfaction. As well as Fallout 76, you might also like to know that The Elder Scrolls VI was revealed at Bethesda’s conference. I just wouldn’t expect it to actually be playable for a good long while yet.